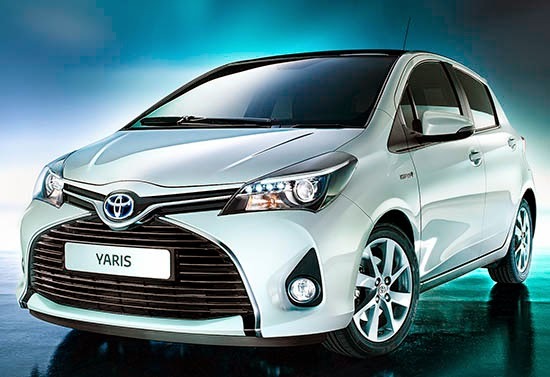 The Yaris is getting a new look for 2015. Not as much as the Camry, but still. A whole new front and revised rear and interior. The car pictured here is the Hybrid version which we don't get. This thing has too much ugly going on! Just when I thought they broke their own record of ugliness with the new Camry, we see this abomination. If there is anyone (Japanese designers?) out there who can explain the design rationale for this vomit inducing face, I would love to hear it! Nice improvement over the current styling. Nice improvement over the current model's styling. Why does the front of every Toyota and Lexus look like some sort of industrial HVAC machinery? Just horrible. Cute rear. Unattractive front-- complete with black plastic teardrops... tears of a clown?